Samsung Electronics is highly likely to unveil foldable smartphones in the third quarter of this year, according to sources familiar with the matter. “Samsung is expected to roll out more than 100,000 units of fold-out devices in the third quarter,” a source told The Korea Herald. The smartphone, whose panels face outward upon folding, may be used as a 7-inch tablet when unfolded, he said. 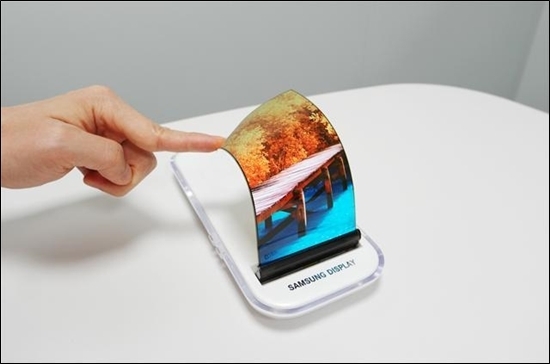 Samsung, had initially completed the development of fold-in phones that tuck the screen inside when folded. It began the development of fold-out technologies around August, deeming that users may find it inconvenient to unfold the phones every time they want to use them. “Since the company already secured fold-in phone technology, it was not a big challenge to shift into the fold-out phones,” he said. Despite technical completion, Samsung Electronics has not made a final decision about whether they will unveil the device this year because of marketability and profitability issues, multiple sources said. “The final decision will be made after the personnel reshuffle of the company’s information technology and mobile communications unit is carried out,” the initial source said. Samsung Electronics’ executive-level reshuffle, which is normally done in December, has been delayed to February or March as the company is currently embroiled in the political scandal involving President Park Geun-hye and her confidante Choi Soon-sil. Samsung’s rival LG Electronics is also expected to produce more than 100,000 foldable devices in the fourth quarter, one of the sources said on condition of anonymity. LG started the development of fold-out technology two to three years ago, and currently has more advanced technology than Samsung, the source said. Unlike Samsung, which is first adopting their new technology into its own products such as the Galaxy series, LG may use the technology for other global clients such as Apple or Huawei. Market research firm Strategy Analytics predicted in the latest report Samsung Electronics may unveil the world’s first foldable phones this year. It also predicted the foldable display market would reach 163 million units by 2022 from 2.7 million units this year.